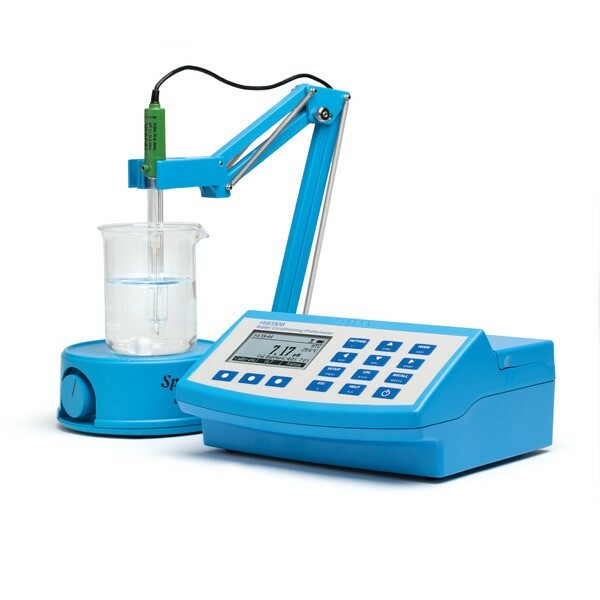 Product information "HI83308-02 Multiparameter Photometer & pH Meter for Water Conditioning"
The HI83308 benchtop photometer measures 15 different key water quality parameters using 23 different methods. This photometer features an innovative optical system that uses LEDs, narrow band interference filters, focusing lens and both a silicon photodetector for absorbance measurement and a reference detector to maintain a consistent light source ensures accurate and repeatable photometric readings every time. The HI83308 was developed to measure the most common parameters in water quality monitoring. One important parameter to test water quality is iron since it can affect color, odor, and turbidity and can also be the most troublesome factor for appliances and surfaces in contact with water. High levels of iron in water can result in clogged water pipes or heat exchangers. Additionally, ammonia detection in water treatment systems is particularly important for aquarium owners and ?fish farm operators since ammonia is highly soluble in water and extremely toxic to ?fish. One other important parameter in water quality monitoring is fluoride. Fluoride is best known for preventing tooth decay. While it does help prevent tooth decay, too little fluoride can be ineffective while too much can cause staining of teeth. The HI83308 offers an absorbance measuring mode that allows for CAL Check standards to be used to validate the performance of the system. The absorbance mode allows the user to select one of the four wavelengths of light (420 nm, 525 nm, 575 nm, and 610 nm) to measure and plot their own concentration versus absorbance mode. This is useful for users with their own chemical method and for educators to teach the concept of absorbance by using the Beer-Lambert Law. HI83308 is designed with an innovative optical system that incorporates a beam splitter so that light can be used for absorbance readings and for a reference detector. The reference detector monitors the intensity of light and modulates when there is drift due to power fluctuation or the heating of the optical components. Each part has an important role in providing unparalleled performance from a photometer. A beam splitter is used as part of the internal reference system of the HI83308 photometer. The reference detector compensates for any drift due to power fluctuations or ambient temperature changes. Now you can rely on a stable source of light between your blank (zero) measurement and sample measurement. The sample cell of the HI83308 fits a round, glass cuvette with a 25 mm path length. Along with the advanced optical components, the larger size of the cuvette greatly reduces errors in rotation from the indexing mark of the cuvettes. The relatively long path length of the sample cuvette allows the light to pass through more of the sample solution, ensuring accurate measurements even in low absorbance samples. HI83308 is supplied with sample cuvettes and caps (4 ea. ), cloth for wiping cuvettes, USB to micro USB cable connector, power adapter and instruction manual. Related links to "HI83308-02 Multiparameter Photometer & pH Meter for Water Conditioning"
Customer evaluation for "HI83308-02 Multiparameter Photometer & pH Meter for Water Conditioning"